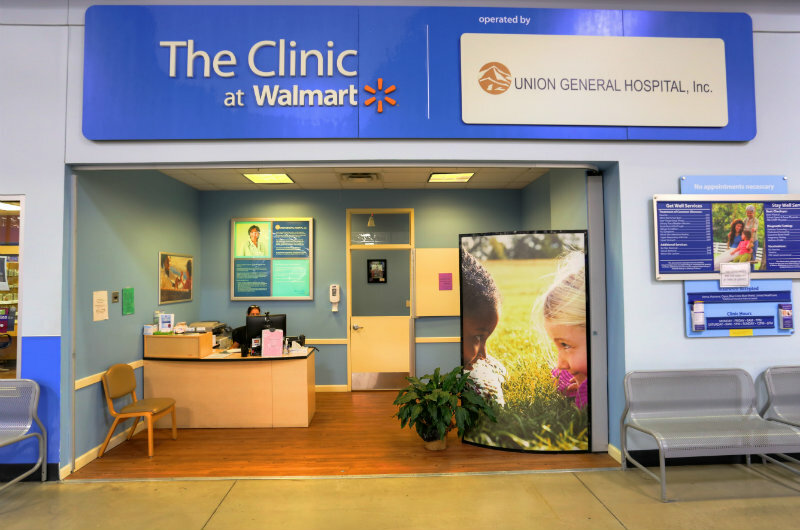 Welcome to the Clinic at Walmart operated by Union General Hospital, Inc. where receiving quality healthcare can easily fit into your hectic everyday schedule. Whether you need a sports physical, health screening, or treatment for a minor illness, it's now as easy as going to your local store. The mission of Union General Hospital is to provide high-quality, cost effective health care, and promote wellness throughout the community and this mission is followed by our clinic as well. We value our patients, medical staff, employees, and quality of care. Our vision is to be the "First Choice" provider of comprehensive medical services for our region. We look forward to serving you and invite you to join us as "Partners in Caring" for all of your healthcare needs. We only see children 18 months and older. We accept our last patient 30 minutes prior to closing. Need more information? Check out our list of services, meet our team and learn more about frequently asked questions. Feel free to call us at 706-439-6860 if there's something we can help you with!